Tips for helping clients of senior care services downsize. As a provider of senior care services, you may have to ask your client if it's time to downsize. This can sometimes be a difficult decision to make as clients typically have many belongings that they don't know what to do with. 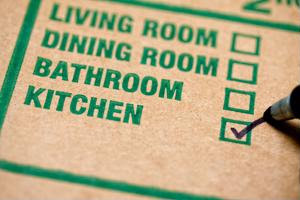 Adults older than age 60 may not always think of downsizing as an option unless family and friends mention it to them. When they decide that it is time to pack up, move to a smaller home, you can be there to help them along the way. Don't do it all at once: If your clients have been living in their home for decades, it's likely they have rooms full of belongings that they'll need to sort through. While it will have to be organized eventually, remind your clients that they don't need to do it all at once. Sorting belongings can take an emotional toll on an individual, so it's best to think of organizing it all in terms of months rather than days. Let their new space guide them: It's easier to know what to bring to a new home and what to leave behind by using the new space as a guide. Your clients should measure their closet and cabinet space and bring along the appropriate amount of items. For the things that are left over, you clients may want to consider hosting a garage sale or putting their belongings in storage. Stay away from "maybe" piles: Don't let your clients put things into a "maybe" pile. They should only give an item a yes or no. This will prevent them from having to go through a pile of items more than once.